The Rev. 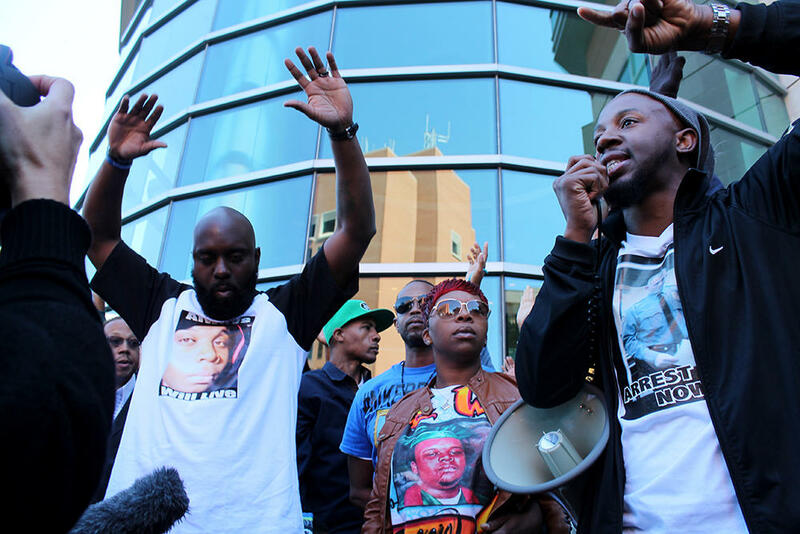 Carlton Lee, right, speaks at a rally in 2014 with Michael Brown Sr., left, and Lezley McSpadden, center. “God is not going to judge you by your behavior in heaven. He’s going to judge you by what you did on earth,” The Rev. Al Sharpton said at the funeral for Michael Brown in August of 2014 at Friendly Temple Missionary Baptist Church. The Rev. Carlton Lee, senior pastor of The Flood Christian Church, was among the first to take action after Brown was fatally shot by a police officer. On Tuesday, June 13, Lee died suddenly from an apparent heart attack. He was 34. Lee's death was confirmed first to The Root online news magazine, by sources close to the family and in a post Tuesday on The Flood Church Facebook page. “The pain of dealing with the transition of our pastor is massive,” the post read. Lee went from relatively unknown man of faith in the St. Louis region, to vocal faith leader in the months of unrest in response Brown’s death.He represented the Ferguson chapter of Sharpton’s National Action Network. He stood by Brown's family members during news conferences in the weeks that followed. “We want an arrest, indictment and charges brought against Darren Wilson,” Lee told reporters in front of the Ferguson Police Department in August 2014. None came to pass, but he stayed committed to what he felt he was led to do as the Brown family pastor. Lee prayed over and baptized Michael Brown Sr. as the family prepared spiritually for the outcome of the looming decision as to whether or not St. Louis County Prosecutor Bob McCulloch would issue an indictment against Wilson. On the evening before a grand jury decided to not indictment Wilson , Lee urged protesters on the stretch of West Florissant Avenue, near the Canfield Green Apartments, where Brown was shot to remain calm and peaceful. At the same time he was doing so, his own church on the other side of West Florissant mysteriously burned to the ground. “The police called me and told me the church was on fire,” Lee told NBC News. “I was in complete disbelief. I didn’t think anyone would set a church on fire. I feel like one of my children has died. I put my blood, my sweat, and my tears into this church, getting this church built from the ground up. Lee was featured in The Washington Post for his work in Ferguson. The newspaper also covered the loss of his church’s sanctuary during the height of the unrest. The Flood was still in the process of rebuilding, and worshipping at a temporary location on West Florissant Avenue, at the time of Lee’s death. He seemed especially hopeful and optimistic about the future of his ministry in his final Facebook message on June 5, which sang the praises of his members for “walking into their assignments” with respect to employment, education and spirituality." Lee is survived by his wife, Chanel, and their five children. The couple just welcomed their fifth child, daughter Cassiah Royalty Lee, on May 28. Outside Greater Grace Church in Ferguson on Sunday afternoon, upward of 800 people gathered for a rally for Michael Brown. With the church full to overflowing, the crowd outside held signs and chanted much like they did at Saturday’s march and other demonstrations this past week. But inside the sanctuary there was a different tone. The enormous crowd inside sang worship songs, raised their hands in praise and even responded with an occasional amen.